Anticipating Growing Tooth Often Fussy Baby - The first time a baby teething is a precious moment that the parents are waiting for. But this event can also be a troubling time because some babies will become fussy than usual because it feels itchy and sore. Although not yet seen, but you can know that a small teething grows by recognizing common traits, including liking to insert and chewing objects that hold it, salivate more than usual, more fussy than usual due to painful or swollen gums, difficulty sleeping soundly, or not wanting to eat. Symptoms of fever or diarrhea are not medically proven. There are several ways that can be done to reduce the discomfort that the baby felt when growing teeth. You can choose either alone or combine as well. Teether is a baby-shaped toy that is easy to hold and safely inserted into the mouth. some teether can be pre-cooled in the refrigerator to be used by the infant to relieve itchy or uncomfortable itching of his teething gums. Even so, avoid putting it in the freezer so as not to harm the baby's gums. Teether is widely available in various brands, shapes, and materials. Be sure to buy a teether with a label that ensures that the object is made of materials that are not harmful to the baby. In addition to teether, you can use a cool, cooled flannelette. Do not forget to wash and clean all these materials thoroughly every day. then a baby puts things that are not necessarily clean, if he's six months old, give a healthy snack as a replacement. A piece of carrot or apple can be the right choice for a baby to grab and bite. But avoid giving food money containing sugar, such as chocolate or to avoid tooth decay. In addition, always accompany the baby while eating food to reduce the risk of choking. Sugar-free cold sugar can be given as a pain reliever or itching for a toddler six months and up who is teething. Just make sure the drink is not too cold. Swipe an itchy baby gum with a small clean finger or flannel. This mild pressure is expected to make the baby more comfortable. Growing tooth babies who put things in the mouth generally salivate more and more often than usual. To reduce the rash due to saliva, frequently wiping the face, especially the area around the mouth with a soft wet cloth. If it is felt very disturbing, the doctor will prescribe paracetamol or ibuprofen in small levels. But make sure you do not give over-the-counter medicines without consulting your doctor. In addition, do not occasionally give aspirin for toddlers because this material is at risk of causing disruption to the brain and liver, so that new may be given to patients over 16 years. Drugs such as benzocaine are also at risk for side effects such as a drop in blood oxygen levels or methemoglobinemia. 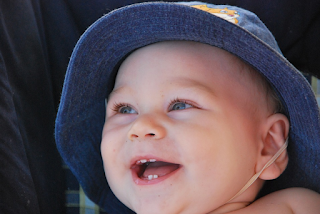 Taking care of a new baby's tooth requires special handling differs from that of an adult. To keep the bacteria from sticking to the newly emerging teeth, clean them gently with a slipper or clean flannel cloth that is swiveled to the tips of the mother every meal and before bedtime. After the baby is big, you can start using a special toothpaste for a non-spicy baby. Sugar is the main cause of cavities. Toddlers who consume sweet foods every day are more at risk of dental pain. However, the most dangerous is the drink of intestine that is consumed from a bottle or feeder cup because the teeth immersed in liquid sugar for a long time. Therefore, to prevent cavities. Avoid giving it a drink other than breast milk or formula and mineral water. If giving another smear, avoid adding sugar to it and avoid giving drinks containing high sugar content such as syrup or milk containing sugar. Drinks that contain acids like fruit juice also bring a similar risk. You can still give your manus and juice diluted ten times just during mealtimes, but not beyond that time.